With Saturday’s exhibition game against Acadia just three days away, THFB presents its annual captain’s Q&A. Since Matt Grzelyck, now in his second season wearing the “C,” was interviewed a year ago, this year his assistant captains, seniors Danny O’Regan and Matt Lane answered our questions. The two interviews are linked here on the Blog Annex. ►Terriers have made a few schedule changes with three games—Providence on Nov. 13, Michigan on Nov. 20 and BC on Jan. 15—beginning at 6 p.m. and the Feb. 20 New Hampshire game now beginning at 7 p.m.
►The Daily Free Press’s Sarah Kirkpatrick talked with TJ Ryan and his father, Tom Ryan, about the difficult decision to retire from hockey due to multiple concussions. ►College Hockey News offers 10 things to watch for this season, including who will succeed Jack Eichel as Hobey Baker Award winner. O’Regan, who scored 50 points last season, is in the mix. The list of "can’t miss" games includes: BU vs. Providence (10/13-14); Red Hot Hockey vs. Cornell at Madison Square Garden (11/28); vs. Harvard (1/7); and vs. Lowell (2/12 & 13). 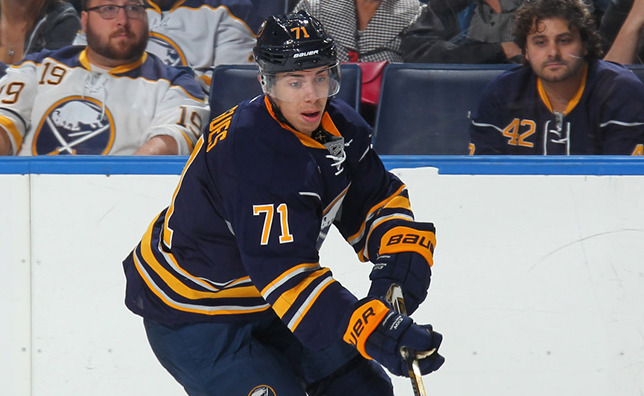 Jack Eichel’s second shorthanded goal of the pre-season and a pair of Evan Rodrigues goals paced Buffalo to a 4-0 shutout of Toronto. Rodrigues, who earned first-star honors, scored on a wrap-around and later on a rebound. Adam Clendening furthered his bid to make the Pittsburgh Penguins roster, scoring a shorthanded goal in a 4-2 win over Tampa Bay. Former Terrier Assistant Captain Justin Courtnall has joined the ECHL Allen Americans, a San Jose affiliate and defending Kelly Cup champions. 2017 recruit Patrick Harper, who yesterday made the Central Scouting Players to Watch list, is leading the Neponset Valley River Rats 18U team (Mass. Select Midgets league) in scoring with a 4-5-9 line in four games, including two game-winners. Harper, who will skate for Avon Old Farms again this season, plans to play in the USHL at Omaha next year, before arriving on Commonwealth Ave. The Terriers were ranked #3 in the first USCHO poll of the season, announced yesterday. BU, which received six first-place votes and trailed only top-ranked BC and Minnesota Duluth, will face eight of the top 20 ranked teams during the regular season: the BC Eagles, #5 Denver, #7 Providence, #8 Harvard, #12 Yale, #13 Michigan, #14 Lowell, and #18 Quinnipiac. ► The Big 10 Conference’s media poll ranked Michigan #1 followed by Minnesota and Michigan State. BU will host the Wolverines on Nov. 20 and 21, while the Terriers’ home opener on Oct. 17 comes against another Big 10 school, Wisconsin. NHL Central Scouting has issued its Preliminary Players to Watch report for the 2016 draft, which includes freshman defenseman Charlie McAvoy, four 2016 recruits and one 2017 recruit. Of the 24 "A" ratings given out, three went to Terriers. Long Island native McAvoy is the only Hockey East player to receive an A rating. 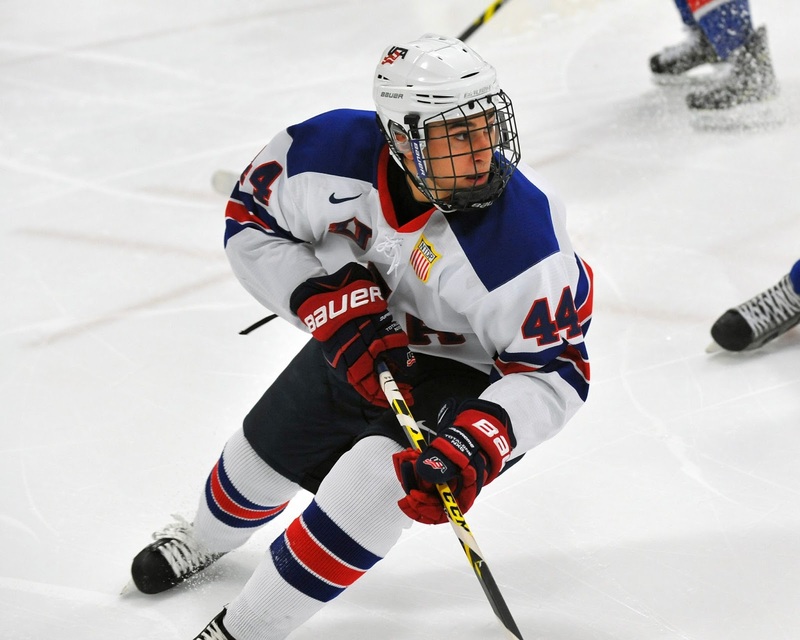 NTDP U18 forwards Kieffer Bellows and Clayton Keller earned A ratings, while their teammate, defenseman Chad Krys (photo courtesy of Tom Sorensen), received a B. Forward John McDermott, a 6'1" center in his senior year at The Westminster School, received a C rating, as did 2017 recruit Patrick Harper who led Avon Old Farms in scoring last season with 47 points in 22 games. 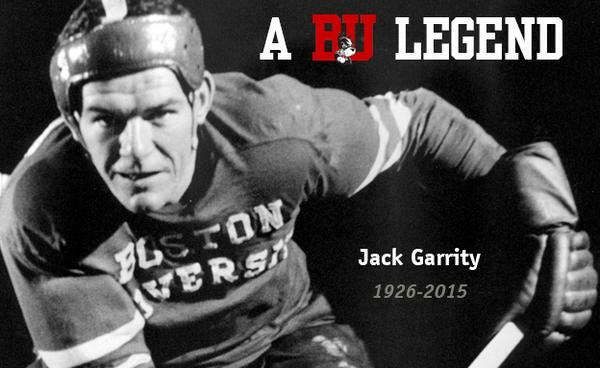 The Boston Globe’s Marvin Pave authored a retrospective on the life and hockey career of two-time All-American Jack Garrity, who passed away on Aug. 31 at age 89. The Medford, Massachusetts native scored 51 goals and 84 points as a sophomore in 1949-50, leading BU to the Frozen Four, along with Jack Kelley, Walt Anderson and Ike Bevins. Garrity had arrived at BU in 1948 as a 22 year old, having served in the Army Air Corp following high school and then skating for the U.S. National Team in the 1948 Olympic Games in Switzerland. After graduating BU in three years, he went on to a 40-year teaching and coaching career and played adult hockey until he was 78. 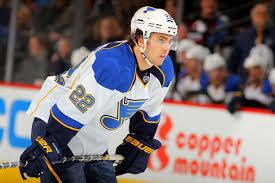 Former Terrier captain and Olympian Kevin Shattenkirk, recovered from the injury that cost him 25 games last season (following the best start of his NHL career) is healthy and talks about putting together an "elite" season on the St. Louis blueline. Former Terrier captain and Bruins head coach Mike Sullivan began his first training camp as head coach of the AHL Wilkes Barre/Scranton Penguins. In July, Sullivan ran the Penguins Development Camp, which was attended by Terrier goalie Sean Maguire. Back in Pittsburgh with the Penguins varsity, Nick Bonino made his preseason debut after being out with the flu. Coach Mike Johnston discussed what the former Terrier standout brings to the team. Among the 47 players in Pittsburgh's camp is former Terrier Sahir Gill, who played 12 games with the Baby Pens last season, as well as 25 with AHL Hamilton and 26 with ECHL Wheeling. Charlie Coyle talked with ThePinkPuck.com about his path from street hockey to the NHL. Coach Brian Durocher talked with the Daily Free Press about the team’s deep pool of talented forwards. A trio of future Terriers combined to score all six goals in the NTDP U18s’ 6-4 win against Youngstown in Team USA’s regular-season opener. Left wing Kieffer Bellows, who was USHL Rookie of the Year with Sioux Falls last season, notched a hat trick, including the game’s first goal and the game-winner on a third-period power play. Center Clayton Keller (photo), who led the U17s in scoring last season, scored twice and assisted on Bellows’ first two scores. Blueliner Chad Krys had a first-period goal and a helper on the game-winner. Bellows assisted on an empty-netter to complete a four-point night. A fourth BU 2016 recruit, goalie Jake Oettinger, stopped 18 Phantoms’ shots. ►Bellows earned the USHL's CCM Forward of the Week honors for his four-point performance. 2018 recruit Jack DeBoer scored a goal and added a pair of assists for the Yale Midgets 16U in a 7-0 win over the NJ Freeze at the BJB Shootout. 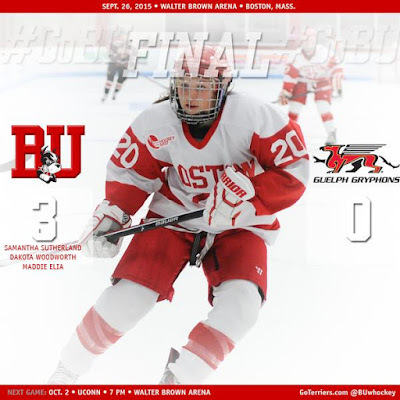 Terriers blanked the University of Guelph in an exhibition game at Walter Brown Arena, 3-0. All of BU’s scoring came in the second period with goals from senior Dakota Woodworth and juniors Samantha Sutherland and Maddie Elia. Junior Victoria Hanson and sophomore Erin O’Neil split the goaltending duties and stopped a combined 16 shots. Terriers will raise their fourth consecutive Hockey East Championship banner next Friday before the season opener against Connecticut in a 7 p.m. start at WBA. Marshfield mates to be reunited ?